Thank you for your interest on Serpiente Birth & Spectrum Services. Our visions is to support families and individuals going though times of transition. We are invested on providing support across the spectrum of reproductive experiences and centering the experiences of diverse of individuals and families in the work that we do. We whole-heartedly encourage LGBTQ, families of color, spanish-speaking parents to learn more about our services and get to know us! Learn more about the emotional, physical and informational support Serpiente offers to individuals and families expecting a new addition to their families. Get to know the services Serpiente provides for those seeking post-partum support, the services offered varied greatly depending on your needs! 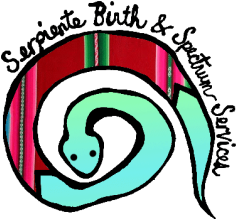 Serpiente greatly values the post-partum period and believes that a well-supported post-partum period impacts the birthing person's future sexual and emotion health. Serpiente believes in abortion on demand and without apology. We see reproductive experiences as a spectrum, and abortion support is a very important part of people's reproductive lives. We also offer support to individuals and families experiencing unexpected birth outcome such as miscarriage, stillbirth, or infant loss. The placenta is a sacred organ that has been forgotten by modern western practices. Learn more about the services that Serpiente offers to take full advantage of the health and emotional benefits the placenta provides to the birthing person and family.